I feel very fortunate to live and work in California. Being an Interior Designer on the Central Coast has allowed me to work on a multitude of projects. From nurseries to restaurants, each project has been interesting and fulfilling. Being immersed in design I spend a lot of my time researching the latest products, trends and design styles. Much of the architecture in California has a Spanish or Tuscan flavor. I have to say that is predominantly the design style most people prefer here. So today I’m sharing with you one of my favorite little tricks. I have found a great product that has a huge impact when used correctly and it’s a lot less expensive than wrought iron. I just love this product. It’s called Tableaux. If you are local and you would like to see the product in person, check out Rosa’s Restaurant in Pismo Beach. When I designed their remodeled I used it in the bar and even on the ceiling! Tableaux is light weight but has the look and feel of custom wrought iron. It comes in many finishes, designs and is easy to install. 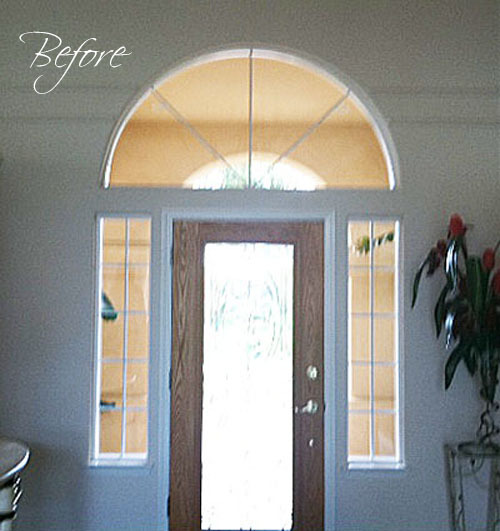 You can see how I was able to transform my client’s front door with this product. So if you are looking to give your home an instant make over, this would be one of my recommendations. Bonus tip: Stain the Oak Doors in Sherwin William’s Bistro Walnut. Second Bonus Tip: Don't just visit Rosa's for the decor, make sure to dine there too. The food is heavenly!